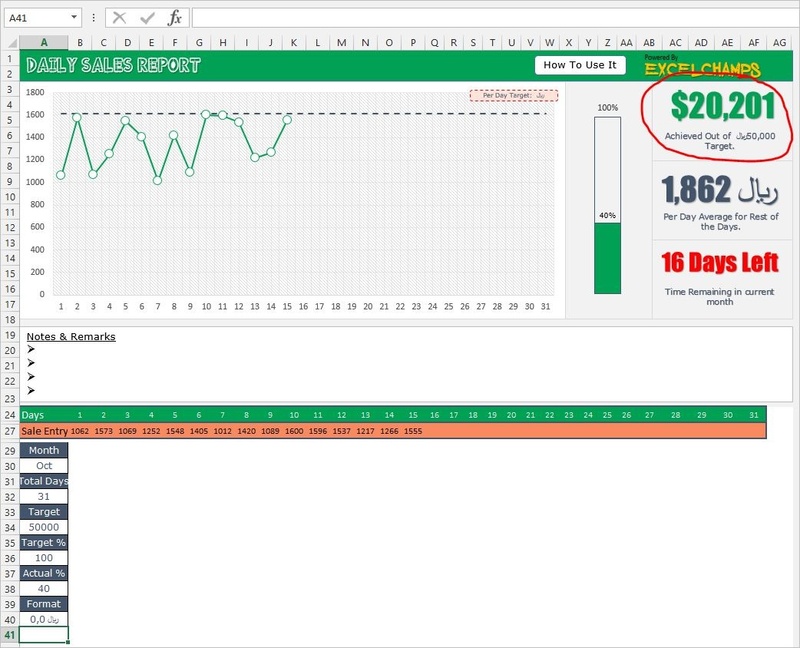 One of the first templates which I created on Excel was for a Daily Sales Report. You need a format which is quick and simple to use. You can’t spend a lot of time every day to create a sales report, especially at end of the day. So today, I’d like to share with you one of my favorite template which I used to share with my boss at that time. I pretty sure this daily sales template will make your boss smile, even if the sales are going down. This is a one-page template with a simple format to understand. But before you download it, let me tell you how to use it and what are the features of this template. There are some key features which make this template easy to use. So read ahead to get a detailed view of these features. To track day wise performance, you have a chart and in this chart, you can get day wise performance against the target. To compare daily sales with the target, we have a target line in this chart. When you input your monthly target, this template will convert it into a daily average. And, that target will be a benchmark for your daily performance. A small message box at the top will remind you about the daily average you need throughout the month. Next to our daily sales chart there is a thermometer chart to show the total percentage achieved. This simple chart will help you to track what you have achieved month till date. The first box in the section will give a quick snapshot of sales you have done against the total target. Next box will alert you about the per day average you have to manage for rest of the days in the month. This figure will change every day based on your performance till date in the month. If your day wise sale is are less than expected per day target, this figure will increase or vise verse. This box will show you the days left in the month which is a driving factor for your performance. The calculation of these days is dynamic. We also have a special notes and remarks box. You can use this section to add some special notes. I used to collect remarks from my sales team before submitting this report to my boss. You can this section in your way. As I told you that it’s super easy to prepare this template, all you have to do is just input your following data. Before you start tracking your daily sales make sure to select the current month. Selecting current month is important because this will define the total number of days. Let’s say you have selected “Sep” then the total days of the month will be 30, and if you select “Oct” then it will be “31”. For this, all you have to do, just use this drop down to select the current month. Once you select your current month the next thing to input is your monthly target. There is a direct connection between your monthly target and total days of the month. As soon as you enter your monthly target it will calculate the per day average we need to meet the total target. If you have a monthly target of $50000 and month days are 31, then the per day average will be $1613 per day. So, just enter your monthly target in cell A34. You know the best out best part of this sales format? You need little efforts to input data. Now, here is the main thing you have to enter “Day Wise Sale”. In the table below, you can enter your sales on daily basis. And, once you do that it will update the calculation in the entire template. This is the only thing you have to do every day as rest of the two are one-time input. Important Note: If you have selected a month which has 30 days, then you have to enter the sales for only 30 days. And, for 31 days, input sales for 31 days. This daily sales report template is fully dynamic. There is no need from your end to make any change. But, if you still want to customize it just follow me. Before you customize this template make sure to unlock the worksheet. And, here I have some important points for you If you want to customize this daily sales report template. I have used the dollar as the currency format in this template. But if you want to change that format, just make this little tweak. Go to cell A40, where I have pasted the $ format. Just change the dollar format with your desired one. Make sure to maintain the cell format for cell A40 as text. To change some keynote messages just tweak in AG26:AG37 for that. This cells range contains the entire messages used in this template. I hide the messages by changing the font color to white, make sure to make it visible. Download this template from here to try it yourself. This daily sales report template will give your boss a quick impression about the daily sales. It’s a fact that anyone can understand this format in seconds but the thing is it’s super easy to prepare. Please don’t forget to share this template with your friends. I am not able to change the dollor in Rs. in achieved out of. Kindly help to change as Rs. Dear Puneet, I cant change the $ sign even changed format from column 40A. format only changed for PER DAY AVERAGE not for ACHIEVED TARGET. Please advise. How to change the $ sign on the sales achieved. I managed to change everything except the big number on the sales achieved by changing the cell A40. Is there anywhere I need to change besides that? Please could you explain the next on the daily sales report template. I can chose the month, but the diagram & data are the same for every month of the year. Is it possible tto have the separate data & diagram for everey related month after you have chosed it from the list? thank you! Is there a way to set this up to only list days worked, with a daily goal for those days and not measure days not worked? I can’t Change the Currency Format , also if I delete $ the green box doesn’t change . I have a question. How to change the $ sign on the sales achieved. Rest i have done. Thanks for sharing your work with us. You need to change the format from cell A40. Reply to me if you need further help. Hey genius, Thank you for sharing a great work. Halo, I have a question. How to change the $ sign on the sales achieved. I want to have SAR. Sign instead of $ but whenever I am changing the format its giving error please help me out. A wonderful thing to start with, however I am not sure if this is a bug or I am missing on something. When I change the value to Rs. it reflects on all parts accept the achievement figure which still stays as dollars. I was trying to upload the screen shot here which is just 226 kb size .gif file but it keeps giving me error for upload. Can we resolve this on email or watsapp ? this template looks great. I dont make sales reports but Im sure that I can learn a lot from studying it. BUT when i tried to download it I only recieved the Productivity guide, not the template! I am trying to download but i cannot do so as it keeps saying the site is not available. Can you kindly give me a link that works? 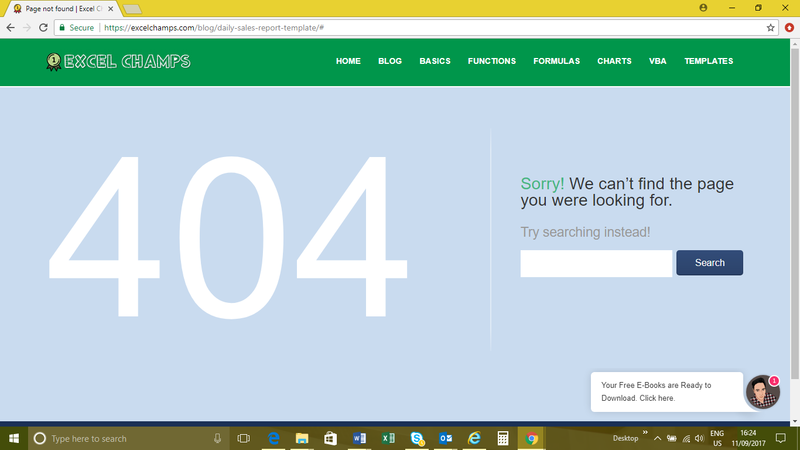 Can you please send me a snapshot of error? It’s working on my side. I have uploaded a screen shot below. I’m sorry you faced this problem. Check your inbox now. Thank you for your response. I am waiting as i still don’t have anything in my inbox. Should i expect a link or the template? There is no snapshot I have found. But I have sent you an email again. Hello Puneet, are you able to help me? I uploaded the screen shot. anything to help? I want to have Aed. Sign instead of $ but whenever I am changing the format its giving error please help me out. Show me your error snap-shot. Thank you, your template really help me. Keep on man! Wow, This is the cools DSR Template ..but unable to download it, can you send to me on gshuvishesh@gmail.com. Can you help me to add in another trend line for daily costing so that we can see the profit margin. Thank you.